Item(s) description: "Bugslock" is a mosquito controlling product to repel the mosquitos with a 100% natural aroma. It is a creative and band shaped product, which prevents mosquitos from approaching by wearing it on the wrist or ankle, where the item emits an aroma that the insect can't stand. As it is small in design and easy to carry, it is usable at anytime, thus it is considered a very convenient product. Plus, it is a safe product, which can be used even by infants, in other worlds, all age groups can use it because it is made of non-toxic substances. It is an elegant product with its various colors and refined designs, hence, it can be used as a form of accessory for women and also a fun children's wear item.About 2 million peoples reportedly die of malaria each year. The main reason for it includes the increase of the number of mosquitos in a geometric progress because of the decay of the natural environment and the lengthening of the mosquitos' life span due to global temperatures rising. We have been using many kinds of insecticides for the last several decades so that we may be protected from the mosquitos' bite. It has, however, had the negative side effect of ruining the environment in the process. And it has produced a variant of mosquitos that carry new strains of sickness. Under these circumstances, we have needed to develop some new products, which will not produce harmful side effects to both the environment and humans, not to mention, they can set us free of the mosquitos' bite. Since some ten years ago, their has been intensive research carried out in some of the advanced countries to develop the products. Though Hannaeeum Inc.'s "Bugslock" has been developed somewhat belatedly, it has been recognized in its quality within the global market, thus allowing the firm to compete fairly with advanced countries' many other related products, and, thus, the products have been shipped to 10 or so overseas countries. The company has been constructing its production lines within Southeast Asian countries, the countries located inside the area are also the largest mosquito expellent market in the world. 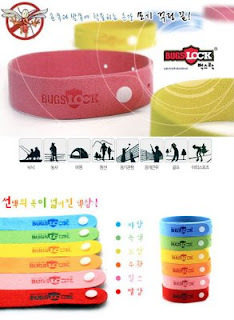 Now, the "Bugslock," a global first class product, is now more widely accessable to worldwide customers.Ingredients1. 100% natural essential oil including lavender, etc.(30%)2. Inert(70%)3. Net Weight(3g)Available color : blue, yellow, pink (sold),greenLifespan:-Bugslock can be used for accumulated up to 240 hours, not 10 days. Example if you use it for 10 hour, after 1 month, it still have balance of 230 hours. Put it back to the original bag and sealed it after you consume.